The rate of naturalization has risen markedly over the past decade. By 1995, 48% of those eligible to naturalize had done so. By 2005, 59% had naturalized. (The naturalization “rate” describes the share of eligible foreign-born residents who obtain citizenship papers, so it is higher than the share of all legal immigrants who do, which was 39% in 1995 and 52% in 2005.) Some groups are more likely to naturalize than others. This section delves into the most noteworthy differences and describes how they have changed over time. Regression and decomposition analyses show that the recent increase in the naturalization rate has been primarily the result of changes in the behavior of immigrants rather than changes in the characteristics of the immigrant population. Nearly two-thirds of the increase in the naturalization rate from 1995 to 2005 is attributable to the increasing tendency on the part of immigrants to become citizens. Just under 40% is due to a change in the makeup of the eligible population: The share of long-term immigrants, who are most likely to naturalize, grew. Countering that was a small downward pull because immigrants from Europe, who have the highest naturalization rate, are a shrinking share of the eligible population while Mexicans, who have very low rates, are an increasing share. Of the three major regions contributing to U.S. immigration, Latin America had the lowest naturalization rate. Asia had the highest, followed closely by Europe and Canada. (See Appendix Table 3.) The Middle East, although still a small contributor to U.S. immigration, had a naturalization rate of 77% in 2005, higher than Asia’s. Latin America had a naturalization rate of 46% in 2005. But only 35% of eligible immigrants from Mexico, the single largest contributor to U.S. immigration, had naturalized in 2005. The rest of Central America was only slightly higher (41%). The rate for South America and the Caribbean was just over 60%. Among major sending regions, immigrants from Asia have the highest naturalization rate (71%). Europe and Canada, the major traditional sources of immigration to the U.S., have long had high naturalization rates. Seven of every 10 European immigrants were naturalized in 2005, as were 57% of Canadian migrants. The longer immigrants stay in the U.S., the more likely they are to naturalize. Most legal permanent residents who have been in the country for more than 10 years become citizens. Most who arrived six to 10 years ago have not, though presumably they are eligible. Typically, the naturalized share of a cohort that arrived in any given year rises sharply for several years after becoming eligible for citizenship, and then levels off. Almost three-quarters of the longest-term immigrants—those in the U.S. for more than 20 years—had naturalized. Just over half—53%—of those who arrived 11 to 20 years ago had done so. Only a third, or 31%, of the immigrants who arrived six to 10 years ago had naturalized. The U.S. Office of Immigration Statistics has tracked the naturalization trends of groups of people who became legal immigrants in the same year. Its research also shows how the pace of naturalization has increased. Among immigrants admitted in 1990, 32% had naturalized after 10 years in the U.S.1 Up until that point, the pace of naturalization had remained relatively unchanged. The comparable figure for 1985 admissions was 35%; for 1980 it was 34% and for 1975 it was 32%. But among those admitted in 1995, the share naturalized had increased markedly as almost half (49%) had become U.S. citizens within the first 10 years. Examining the cohorts after longer stays in the country emphasizes that the increases have occurred in recent years. After 17 years in the U.S., the 1975 cohort had achieved a naturalization rate of 41%. In contrast, almost 49% of the 1980 cohort had naturalized after 17 years in the country. The same pattern of accelerated naturalization appears in data from the CPS, aggregated into four-to-five-year periods to gather more statistically reliable samples. It took 12 years for the cohorts that entered in 1992-95 to reach a 48% naturalization rate. [See Figure 9] It took 14 or 15 years for the 1984-87 group to reach that level; 16-17 years for the 1980-83 cohort; 18 years for the 1975-79 entrants; and 23 years for immigrants who arrived in 1970-74. The naturalization trajectory differs somewhat depending on where immigrants come from, but all groups show some evidence of a speedier tendency to naturalize. Among Mexicans and Central Americans, for example, immigrants who arrived in the 1980s reached a 20% naturalization rate in 13 to 16 years. Those arriving in the 1970s took 19 to 24 years. The pace clearly is more rapid among immigrants from the Caribbean and South America. Groups arriving in the late 1980s to mid-1990s took 10 or 11 years to reach a 40% naturalization rate. Those arriving in the early to mid-1980s took 13 to 15 years to get there. Immigrants from a grouping of countries that includes mainly Asians, as well as migrants from Africa and Oceania, also have accelerated their citizenship rates. Among those who arrived in 1988 to 1995, about 45% had naturalized after 10 or 11 years. For cohorts in the early to mid-1980s, it had taken 11 to 14 years. Among European immigrants, it took 16 to 21 years for those who entered from 1975 to 1987 to reach a naturalization level greater than 60%. The next group, those who entered from 1988 to 1995, took only 10 or 11 years. In fact, of those who entered in 1988–91, three-quarters had become citizens after only 16 years, equaling the long-term rate of earlier European entrants. This section explores changes in the rate of naturalization for different countries and regions. It also assesses how the tendency to naturalize has changed over time. Statistical analyses were used to determine the possible impact of country of origin on naturalization tendencies. The analyses take into account differences across countries and changes over time in the composition of the immigrant population. The results clearly show that the tendency to naturalize has increased significantly between 1995 and 2005, regardless of an immigrant’s individual characteristics. An eligible immigrant’s odds of having naturalized were 40% to 50% higher after 2000 than in 1995-96 (see text box). The onset of the increased tendency to naturalize began at different times for different groups. For long-term immigrants (those in the U.S. for more than 20 years), the acceleration began in 1998. For those in the U.S. less than 20 years, it began in 2000. The change began in 1998 for Mexican and Caribbean immigrants but later for others. Asian immigrants did not experience a sustained rise in the tendency to naturalize until 2001, and Middle Eastern immigrants until 2002. Only in 2004 or 2005 did increases appear for immigrants from Africa, Europe and Canada. The logistic regression analyses looked into the impact of a wide variety of individual characteristics on the odds of naturalizing and whether they might be driving naturalizations up. Among them were the immigrants’ country and region of birth; how long they lived in the U.S.; their age; education; gender and labor force status; marital status; spouse’s citizenship; and whether they were homeowners. Also examined were the potential impacts of full- or part-time work; gender without other factors; state of residence; border area residence; blue- or white-collar occupation; and refugee status. The regression analyses looks at the odds of naturalizing rather than naturalization rates. For example: In 2005, 59% of eligible immigrants had naturalized; the odds that this had occurred were 1.43 to 1 (0.59/1-0.59). In 1995, only 48% of eligible immigrants had naturalized; the odds of naturalizing were 0.92 to 1 (0.48/1-0.48). 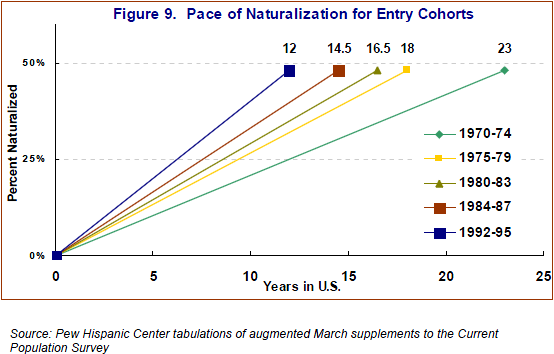 The odds of naturalizing by 2005 were 55% higher than in 1995 (1.43 vs. 0.92). Because Mexican immigrants are the largest single group in the U.S. foreign-born population, their behavior has an outsized impact on overall naturalizations. Mexicans are less likely to naturalize than immigrants from any other region, in part because so many have low education levels, high poverty and other characteristics that are associated with low citizenship levels. Yet even after taking those characteristics into account, their odds of becoming a citizen were much lower than other immigrants, but essentially doubled from 1995 to 2005, with indisputable increases evident after 1996. The odds of an eligible Mexican immigrant becoming a U.S. citizen in the mid-1990s were only a fifth of those of a migrant from Europe. By 2001–05, the relative odds had doubled to about 40%. The naturalization rate for eligible Mexicans, though low, has risen more sharply than that of other groups. In 1995, only 20% of eligible Mexican immigrants had become citizens, but that rate rose 15 percentage points by 2005. Among all other immigrants, the rate rose 11 percentage points, to 66%. Put another way, the share of Mexicans who naturalized rose 75% during that time, compared with a 20% increase for all others. Central Americans are slightly more likely than Mexican immigrants to become citizens, but considerably less likely than most other groups. Their trend has been less clear-cut than some others: Their likelihood of naturalizing rose in relation to European immigrants in 2000-02, but fell somewhat after that. Still, the tendency of eligible Central Americans to naturalize is markedly higher this decade than in the mid-1990s. As a group, Caribbean immigrants are nearly as likely to naturalize as European immigrants. Their likelihood of naturalizing, already high, began rising in the late 1990s. By the middle of this decade, the odds that eligible immigrants from the Caribbean had naturalized were 80% higher than in the mid-1990s. South Americans also are nearly as likely as Europeans to become citizens. But in the mid-1990s, their odds were only half those of Europeans. Those odds began to increase in 2000 and have stayed high since then. By 2005, naturalized citizens became a majority of eligible-to-naturalize immigrants for both South American and Caribbean immigrants. The naturalization rate of eligible immigrants from Asian nations also rose rapidly, going from 57% in 1995 to 71% in 2005. Within the region, the Philippines has had the highest rate, reaching 76% in 2005. As a group, their tendency to naturalize relative to Europeans began rising after 1996 and now is significantly higher. After 2001, eligible Middle Eastern immigrants have had odds of naturalization that are consistently 80% to 100% higher than those of European immigrants. In the years before then, no clear pattern emerged. Eligible African immigrants have only slightly lower odds of naturalizing than do Europeans. Their odds of naturalizing began rising in 2004-05 and grew by at least 60% over 1995 levels. The naturalization rate has risen among both short- and long-term eligible immigrants. Among those in the U.S. for more than 20 years, about three-quarters are now naturalized, compared with two-thirds a decade ago. The tendency to naturalize among those in the country less than 20 years clearly increased beginning in 2001. A majority of those who became legal permanent immigrants 11 to 20 years earlier are citizens, compared with 44% a decade earlier.